Publication on the work of Belgian architect Juliaan Lampens. The architecture of the Belgian Modernist Juliaan Lampens (b. 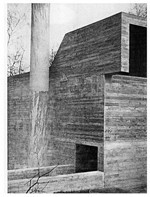 1926) goes beyond designs for conventional living and instead suggests a utopian avant-garde of living without barriers. He experimented with the use of raw concrete and created sculpture-like exteriors leading onto open vistas.